Dr Seuss: Did the chicken cross the road? Did he cross it with a toad? Yes! 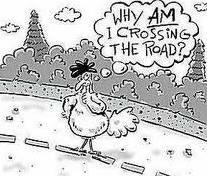 The chicken crossed the road, but why it crossed, I’ve not been told! Martin Luther King, Jr: In envisioned a world where all chickens will be free to cross roads without having their motives called into question.